I know it’s just one day after Christmas and you’re on vacation, but I’ve got a new Christmas list for 2011. See, we’re getting ready for a trip into the California desert later this week, and as we re-pack the Airstream a few ideas have occurred to me. Some of the things I want are pretty tough to find, so I figured you and the elves would appreciate a little extra time. The first thing I’d like is a GPS that doesn’t get lost. GPS is a technological miracle 99% of the time, but watch out for that one percent when it isn’t. How many times has Garminita tried to send us down roads that don’t exist, or blind alleyways in the interest of chopping 15 feet off our route? Why does it take three years to get a new road into the database? It’s no fun having a navigator you can’t always trust. I can see why you use Rudolph. I’d also like a factory-approved bicycle rack for my Airstream. That way I don’t have to carry folding bikes inside the car. If I could pop a pair of full-size bikes on a bumper rack (with protective covers), it would be incredible. I’d probably ride a lot more. Some people say it isn’t possible, but I’m pretty sure Santa Claus can do anything. A quiet fuel cell power generator would be great for long boondocking trips in cloudy places. I love the solar panels we use, but a fuel cell would be a great auxiliary power source — silent, non-polluting, and long-running, under any conditions. This is technology that exists today, so all you need to do is figure out how to get the cost down. I don’t think this exists in the RV world yet, but how about a combination oven/microwave that runs on propane? Right now the limited space inside a travel trailer is wasted by requiring separate convention and microwave ovens. Or better yet, how about a removable RV grill: indoors it’s a regular stove, but you can remove it for grilling outdoors! That way we won’t have to carry our Weber grill in the back of the car. Thanks for bringing me the Blu-ray player for the house. Now, can I get one for the Airstream? This time of year, with long and cold nights, we tend to watch a lot of movies after dinner. That old JVC DVD player that came with the trailer is past its prime. We’d like to be able to see every one of Shrek’s nose hairs on the new HD screen I installed. A new set of Bose speakers would be great, too. Can you try to do something about the state parks in Arizona? We have so few that offer camping, and nearly all of them are in danger of closure thanks to budget problems at the state level. It would be nice if a few of them didn’t have to depend on community bake sales in order to stay open. That’s probably too political for you, so if you can’t do that, how about arranging for biodiesel everywhere? Every drop of biodiesel is effectively carbon neutral, reduces dependence on dino oil, and the exhaust smells like french fries. Even B5 (5% bio, 95% dino) helps, and any diesel can burn that. If I could find it more often, I’d use it more often. I’ve got a bunch of other things I’d like, if you have room in the bag. An instantly self-drying awning would be great for mornings where the fabric is covered in dew and we’ve got to get going. That way it won’t get moldy when we roll it up wet. I’d appreciate a stoneguard that can be left up on a windy night without rattling, compartment locks with unique keys, wheel bearings that don’t require annual re-packing and a truly unbreakable sewer hose. I’d also like to thank you for some of the stuff I got last year. I asked for trailer tires that actually worked, and I got them. I asked for 100 trailers at Alumapalooza, and I got 127. You even delivered me that gift I waited for five years to get: an Airstream entry door that closes properly, with a light touch. So I know you can work miracles. After managing those gifts, I’ll bet my list for 2011 will be a cinch. Thanks, and have a great vacation on The Keys. And how ’bout an “instant on” shower nozzle where you don’t watch a half gallon of cold water go down the drain before it’s hot enough to turn on bare skin. Just love your cover. Who does the great art work? 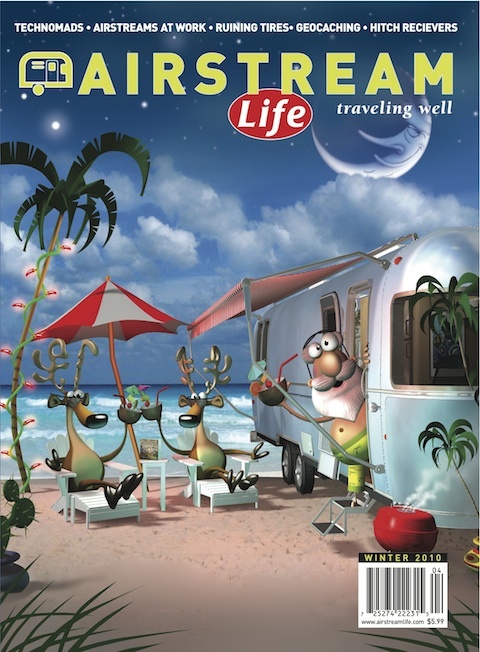 Each Airstream Life cover is done by a different artist. This one was done by the team of Steve Gray and Tom Knight.